We take a common sense approach to building fountains. All Fountains are Shipped Complete & Ready To Operate, Just Anchor & Plug It In! Quick & Easy Installation. No Special Electric Connection Required. Eagle Fountains not only enhance the beauty of your landscape; they also provide aeration of stagnant waters to control algae bloom. Now all Eagle lighted fountain models come with our new LED focused beam projection lighting system. We have incorporated this new LED lighting technology into the design of all our new Eagle lighted fountain models for the ultimate in brilliant lighting effects of the fountain sprays after dark. Even if you have an older pre-2010 Eagle lighted fountain the new lights will work with your fountain. Fountain Spray Heads are now included! Our fountains now offer even better value because we now include our 3 best spray head patterns with every fountain. The 3-tier spray head, the Fanjet spray head, and the Trumpet spray head all come standard with the purchase of any EFS-1900, EFS-2000, EFL-190 or EFL-250 Fountain. Our bigger fountains come with 2 dedicated spray head patterns - the 3 tiered and Trumpet pattern. 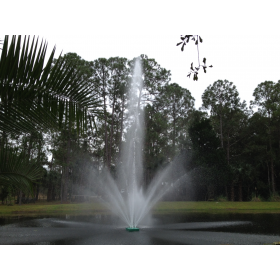 Eagle Fountains are built with heavy duty pumps for dirty water pond conditions. 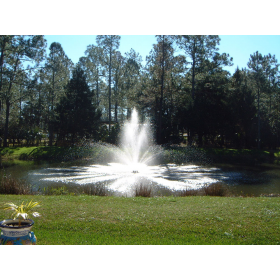 Since 1997, Eagle Fountain Works, Inc., has been manufacturing affordable, top-quality, heavy-duty, outdoor pond and lake fountains with multiple spray head patterns at our production shop in Ormond Beach, Florida. Eagle Fountains is family-owned by four brothers and we pride ourselves in using top-grade materials and skilled craftsmanship to create beautiful pond fountains that will last well beyond normal industry standards. 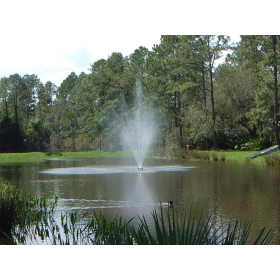 Eagle Fountains uses heavy duty, debris-tolerant Stainless Trash Pumps that can handle rain fed dirty water pond conditions and give you more years of dependable use vs the clean water, residential quality, sump pumps used by other manufacturers. You won't see any other Fountain Manufacturer advertise or state that their fountains are built for dirty water use, because they are not. 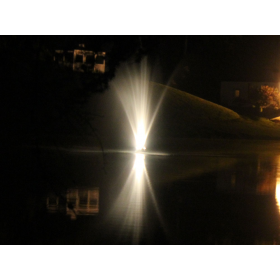 NOW FOR THE MONEY PART- We eliminate any middle man markup by selling our pond and lake fountains at "FACTORY DIRECT PRICES" – right from our website directly to our customers doorstep. We manufacture and sell direct so that you don't pay extra for layers of sales costs. Some of our competitors pay up to 40% in sales costs so your money did not go into higher grade materials for your fountain but rather in a Sales Reps pocket. Our philosophy is to use your money to buy top of the line rugged materials to build you a better fountain. If you see in someones ad "We Sell So & So's Fountain" then you are not dealing with the manufacturer directly. When you buy your fountain from us you are dealing directly with the manufacturer and you will get superior materials, expert workmanship and excellent customer service, GUARANTEED! OUR TERRIFIC CUSTOMERS - We've worked with and provided fountains for some of the largest corporations in America, as well as many HOA's, City Governments, Colleges, Residential and Business Developments of all sizes. 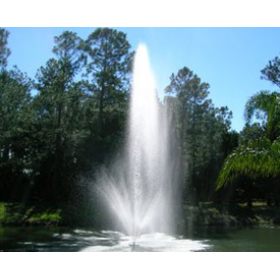 We've supplied fountains for many thousands of applications ranging from NASA facilities to Mom & Pop's back yard ponds. We ship to all 48 contiguous United States, to Canada and the Caribbean. All of our lighted and unlighted pond and lake fountains are shipped as "complete fountain packages": 95+% assembled, fully automatic, and ready to operate right out of the box. No special electrical connection is required and regular household current at either 115volts or 230volts is perfect. Eagle unlighted fountains can be installed in about 15 minutes with our Plug & Play design. You simply won't find a better built heavy duty complete pond fountain package anywhere for the money and every Eagle fountain is backed by our industry leading 3 year warranty. Eagle Fountains outdoor floating pond and lake fountains are perfect for residential lakes and ponds and commercial retention ponds. Our floating fountains not only enhance the beauty of your landscape; they also provide aeration of stagnant waters to control algae bloom. With the tranquil sounds and visual beauty of moving water, an Eagle Fountains pond fountain will make any aquatic garden setting come to life. Your friends, neighbors, and visitors will be dazzled by the beautiful addition of a pond fountain to your landscape and your pond will be healthier too!. Browse our wide selection of standard pond fountains, lighted pond fountains, and be sure to check out our new pond fountain blog. 3 New EFL190 Lighted Fountains now in place at Prasco Pharmaceuticals in Mason, OH. New EFS4000 big lake fountain supplied for The Dallas/Fort Worth National Cemetery in Dallas, Tx. New Eagle Fountains EFL350 Lighted Fountain now operating at Shan-Gri-La Farms in Perkasie, PA.
New EFL250 Lighted Fountain in place for B&C Contracting in Kissimmee, FL. New EFS2000 pond fountain in place at City of Manfield TX, Rose park.